Winter Storm Harper dumped several inches of snow and ice all over the northeast. It led to several power outages and motor vehicle accidents. These were mostly from the ice from that formed from freezing rain. To add to the problem, temperatures plummeted to below zero causing a flash freeze. The temperature didn’t rise Monday so the ice persisted. Ice can do a lot of damage to hardscapes, and with winter just getting started, it’s important to know how to prevent damage. Here are 5 tips for preventing hardscape damage in the winter. If you have movable concrete items such as statues, fountains, and planters, move them inside before the storm. Frozen water inside can cause them to crack and break. If you have larger cracks in your hardscapes, fill them in when you have a warm weather advantage. Please check our locations to see if we have this product in stock. If your crew offers a shoveling service, use plastic shovels to clear hardscapes as metal ones can crack concrete. Pick the right deicer for the hardscape. Calcium-based products and natural rock salts can provide the power you need but will also help avoid damage to your hardscape. Before the snow flys, consider offering a service to seal hardscapes for clients. The sealant will prevent cracks from forming when the ice hardens. 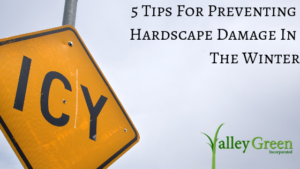 We hope you enjoyed our 5 tips for preventing hardscape damage in the winter. Remember damage can usually be prevented by making preparations in fall. Valley Green was founded by Charles Dooley in 1990. Headquartered in Holyoke, Massachusetts, we have grown to eight branch locations supported by inside & outside sales associates specializing in turf seed, sod production, golf sales, turf maintenance, nursery production, agriculture and arboriculture. The average green industry tenure at Valley Green is well over 20 years per associate!